In the first phase, Tuusula becoming a member of HSL means primarily that HSL’s tickets are accepted in Tuusula from 1 January 2018. This means that journeys from Tuusula to all of the HSL member municipalities can be made conveniently with one ticket. An internal ticket allows you to travel in Tuusula, Kerava and Sipoo. Internal tickets are accepted also on journeys that start and end in Tuusula, Kerava or Sipoo but pass through another municipality. In addition, internal tickets allow you to travel to Järvenpää. 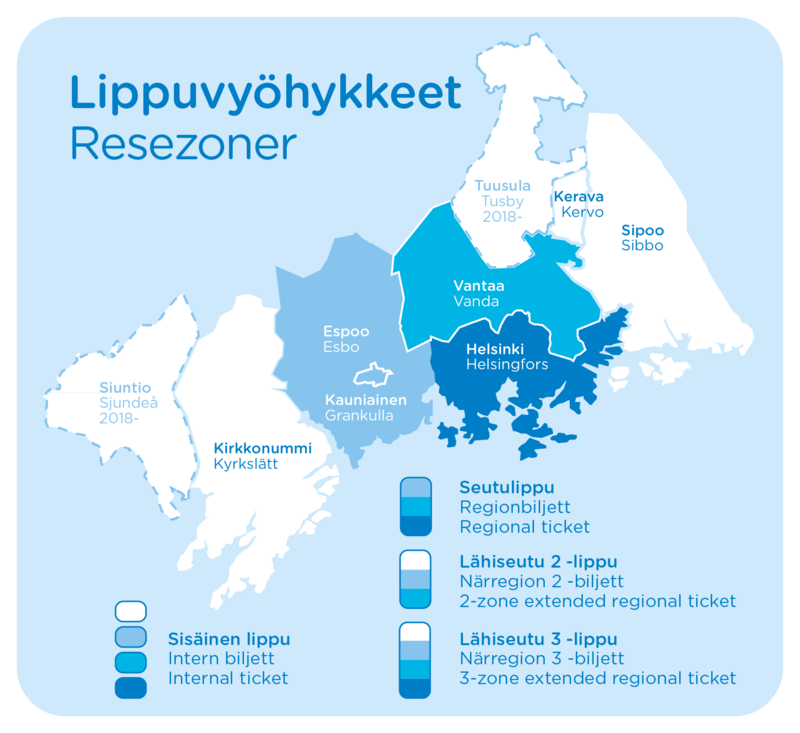 Two-zone extended regional tickets allow you to travel anywhere in the HSL area, excluding Helsinki. Three-zone extended regional ticket allow you to travel anywhere in the whole HSL area. NB! Maantiekylä in Tuusula and parts of Ruotsinkylä are part of the Vantaa fare zone. In future, new fare zones will be introduced and Tuusula will mainly be in the D zone. Get your own Travel Card! Travel Card is the most convenient way to travel in the HSL area. The card is valid on all modes of public transport. You can load the card with value (i.e. money) or with a season ticket of your choice. Travel Cards are available from HSL service points or HSL’s online store (in Finnish). At these locations, you can top up your Travel Card but you first need to purchase the card from an HSL service point, online store, or from the service point located at Hyrylä library. NB! HSL Travel Cards cannot be topped at on buses. The best way to travel in the HSL area is the Travel Card. You can load the card with a season ticket or value. You can use value loaded on a Travel Card to buy single tickets at a lower price, while a season ticket allows unlimited travel for a given period of time within a selected travel zone. Residents of Tuusula can buy a personal Travell Card online (http://verkkokauppa.hsl.fi/liput-ja-matkustaminen/matkakortti, the online store is in Finnish only) or at an HSL service point (use the sales point search to find the service points). If you are a resident of Tuusula and already have a personal Travel Card, you do not need to buy a new card. Residents of Tuusula can buy cheaper, subsidized Travel Card season tickets from 1 January 2018. In addition, single and day tickets are available via the HSL Mobile ticket app as well as from ticket machines, R-kiosks and bus drivers. 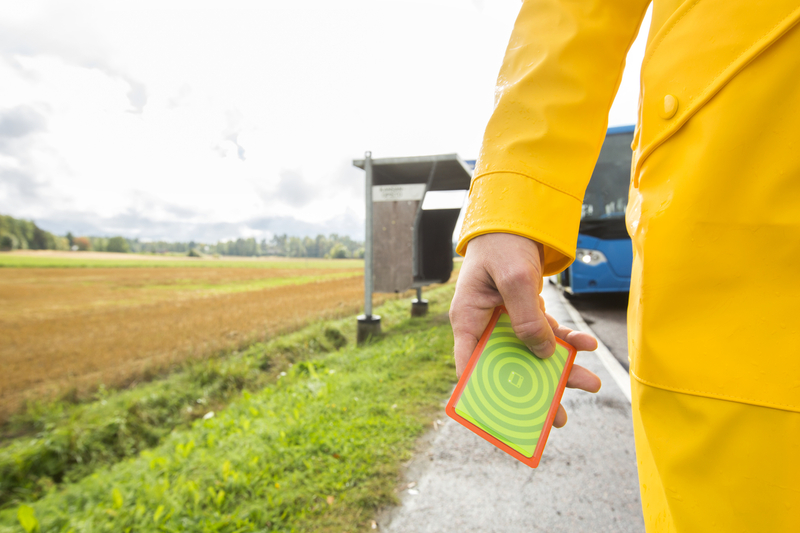 The Tuusula ticket sold by Matkahuolto currently in use in Tuusula allows you get a season ticket for bus journeys in Tuusula or for specific bus journeys between Tuusula and the capital region depending on the zone selected. When Tuusula becomes a member of HSL, the Tuusula ticket is withdrawn, i.e. the tickets are no longer available from 1 January 2018. Tuusula tickets purchased at the end 2017 will be valid until their expiry date. In addition, the former regional tickets for bus journeys in Järvenpää and Tuusula are no longer be available. In addition, VR’s tickets for journeys from Jokela to stations in the HSL area purchased in 2017 will be valid until their expiry dates. From the beginning of 2018, VR’s tickets are no longer sold for journeys between Jokela and the HSL area. You can travel to/from train stations in Järvenpää (Järvenpää, Ainola, Saunakallio, Haarajoki) with HSL’s or VR’s tickets. You can use HSL’s and VR’s tickets on journeys within Järvenpää and journeys form Järvenpää to the HSL area (Jokela, Kerava and stations to the south of Kerava). HSL’s tickets are accepted on those Järvenpää buses that run via Tuusula (665, 667, 689, 765, 965, 967) or Sipoo (786, 986, 987, 989*). On these routes, you can also make journeys within Järvenpää using an HSL ticket. In addition, Järvenpää’s own public transport tickets are accepted on these routes on journeys within Järvenpää and Matkahuolto tickets can be used for journeys across municipal boundaries. On Järvenpää internal routes 21-24 HSL’s tickets are not accepted. On route 25, HSL’s tickets are accepted as the bus runs from Järvenpää via Kellokoski to Hyökännummi. On route 989, HSL’s tickets are accepted only on services running via Sipoo, i.e. route versions 989, 989A and 989J. On routes 989V and 989HJ, HSL’s tickets are not accepted.